Occasionally - once a year in you're lucky - a record comes along and falls into your lap that is so good, so wonderful, that a journalist is positively fearful of writing about it. How can he put into words what only a few bands can put to music? How can one person convey the beauty of a recording without sullying it with mere misplaced words? 'Lesser Matters' is one of those records. The brainchild of Swedish duo Martin Larsson and Johan Duncanson who are the core of The Radio Dept., their long-incubated debut LP is a thing of great fuzzy wonder. Sounding like it was recorded in a world where four tracks are the most heavenly of all creations, the record gently fizzes along on a train of buzzing guitars and strained keyboards, with vocals gently focussing in the background. It has the same majesty and ethereal wonder contained in the best works of the Flaming Lips, Boo Radleys, My Bloody Valentine, Jesus and Mary Chain and Mercury Rev, plus tens of other bands who have bled their soul onto acetate. Normally it's easy to pick and choose what songs to highlight in a review; the best or worst. This is a lot harder. All are of great, great quality, and to pick one over the other would be criminal. But to commit the crime would go a little like this; The sad/beautiful 'Where Damage Isn't Done' skids along like the Lips' 'Race For The Prize' but with a moaning Fender Jaguar replacing thumping drums. 'Keen On Boys' drifts along behind wall of fuzzback with hypnotic metronomic guitars and echoed room-next door vocals. '_Why Won't You Talk About It_' squirms away like a gossamer brothers Reid tune; less 'Sidewalking' than Sideslipping. 'Bus' is possibly the most realised song on the whole album, hinging on a plaintive six string and crescendos with one of those yearning voices that make you wish you were standing in the dark and the rain. '1995' is probably what The Radio Dept. call 'jaunty', but what it really is is a beautiful emotion-lorn paen to youth that would ring warm with coldest of hearts. ?and it goes on and on. It's been out for two-and-a-half months, I've been holding it to my heart, secreting it away for that long, away from clammy media hands and coke-enthused shouts of the next best thing. Perhaps it's now time to tell you about the album of the year. 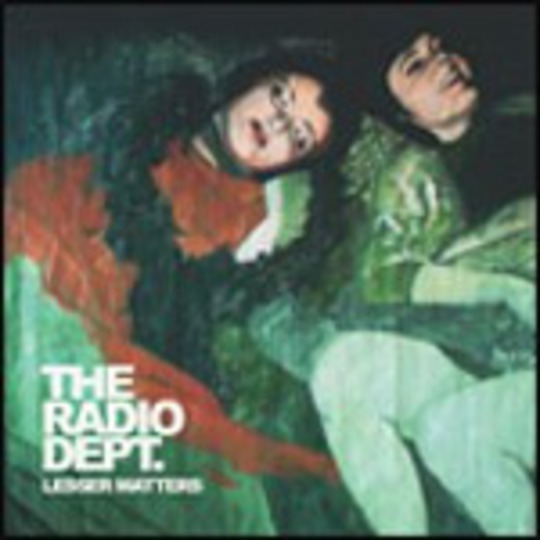 'Lesser Matters' by The Radio Dept.